This bailout is a repeat of the last attempted Fascist coup in America,1933. Backed by the same people that backed the Fascist coup in Germany also 1933. The Reichstag fire was an arson attack on the Reichstag building in Berlin on 27 February 1933. The event is seen as pivotal in the establishment of Nazi Germany. The burning of the Reichstag six days before the election, depicted by the Nazis as the beginning of a communist revolution, resulted in the Reichstag Fire Decree, which (among other things) suspended civil liberties and habeas corpus rights. 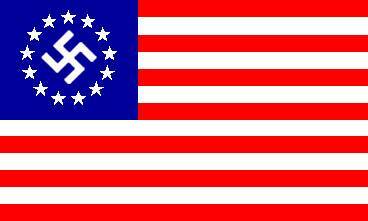 IF THE BUSH’s ARE NOT NAZI’s OR FASCIST’s EXPLAIN THIS…….FASCIST COUP OF AMERICA ALSO 1933? 20 years of unregulated Fractional Reserve banking practices ,.. basically creating money out of thin air by creating debt, which they call money, and charging for services and interest. Artificially raising prices as more people can bid for the items. 20 years later in 1933 the stock market had crashed ,the Great Depression was in full swing and America was BANKRUPT! In 1930’s the public where also being told about the Green shoots of recovery, the Great Depression started in 1929, seemed to steady and recover in 1931ish and then collapsed completely .American did not go Bankrupt until 1933….4 YEARS LATER!! But surely Bush was just an unknowing accumplice! Well he started running companies for Pro Nazi fascists in 1924.He was still doing it in 1942. Dr. Antony Sutton was a research scholar at Stanford University’s Hoover Institution. Through his scientific historical research he saw the bigger picture of how the secret US establishment (largely operating through the Skull & Bones secret society) uses the Hegelian dialectic (create thesis & antithesis to control synthesis) to create, manage and perpetuate conflict. BUT these people do not give a “flying one” about Leftwing or Rightwing politics , just as long as its authoritarian!!! Reaganomics and Thatcherism is all the rage , deregulating the financial industry and CREATING DEBT AND CALLING IT WEALTH ,just like in 1913…. and suprise suprise 20 years later we are looking bankruptcy in the face AGAIN!?!?!?!?! So,a repeat of this is ,the crisis started 2007/8 ,then expect a “recovery” 2009/10 ,this will be a fake “Pump and Dump” recovery(like before ,this is just the REAL stock market players cashing out before total collapse) ,the REAL collapse will happen 2011/12.Probably worse than before as no “New Deal” is on the cards this time. The recovery money is going straight to the bankers, the fascist coup this time has been successful. BUT if we get too restless and start asking awkward questions, expect to be sent off to WWIII.There’s too many of us sheeple running around anyway according to the government. The FEDERAL RESERVE was created to stabilise the dollar value and create a stable market to trade in, let’s see how its done……..
Not a day goes by without talk of the Federal Reserve, whether by the organization itself or by its opponents. An incessant cheerleader of his organization, Chairman Ben Bernanke will be the first to tell you that the Federal Reserve is an utmost necessity to the smooth operation of the U.S. financial system. Some would disagree. And while ongoing events can be difficult to objectively examine, hindsight is usually much more prescient. Let’s set aside what The Fed says for a moment and examine what it actually does. From 1776 to 1912 (136 years), the value of the dollar, relative to the Consumer Price Index, increased by 11%. A dollar could buy 11% more goods in 1912 than in 1776. Thus, if in 1776, you sat on your savings pile of $1,000,000 for 136 years, it would then be worth $1,110,000 in purchasing power (it will have appreciated in value by 11%). A loaf of bread for Thomas Jefferson cost the same as a loaf of bread for Lincoln 50 years later and again the same for J.P. Morgan 50 years after that. The United States Federal Reserve System was created in 1913. The stated purpose of the Fed, by the definition taken from its own website, is to “conduct the nation’s monetary policy by influencing money and credit conditions in the economy in pursuit of full employment and stable prices.” Note that “stable prices” is another way of saying “stable dollar,” they are two sides of the same coin (couldn’t resist the pun). After the Fed’s creation, from 1913 to 2008 (95 years), the value of the dollar, relative to the Consumer Price Index, decreased by 95%. A dollar could buy 95% fewer goods in 2008 than in 1913. Thus, if in 1913, you sat on your savings pile of $1,000,000 for 95 years, it would then be worth only $50,000 in purchasing power (it will have depreciated in value by 95%). One would now need to pay about 20X more than J.P. Morgan for one’s bread. Ask my mother how much the price of milk has increased just in the last ten years alone. In other words, the value of the dollar remained extremely stable for 150 years, the Fed was created in order to “stabilize the value of the dollar,” and the result has been a 95% devaluation of the dollar in less than 100 years following its creation. Since the creation of the Federal Reserve the economy, US and Global, has lurched from one disaster to another, a much worse result than the 100 years BEFORE the creation of the FED!! SORRY GUYS BUT YOU ARE FIRED!! This disasterous experiment has to stop! Fraud trials should start , as I see it was a con from the start. IF the FED is printing ALL the money AND charging interest to the government on this money (which it never had in the first place and just printed out of thin air!!!) Where do we get the money to pay the interest?? There will always be more debt than money …. this is endless ,wage slavery and it should be abolished!! OR we the people print our own money and make the FED accept that in payment , remeber it costs next to nothing to print this and you can charge the FED interest on this as well!!! BUT the FED have been so incompitant and greedy this time ,they have broken thier own gravey train.Because of thier greed and arrogence ,no-one wants dollars anymore ,so no matter how many you print ,the more you print the less worth they all become. Folks, China is through screwing around. They’ve made it clear that don’t HAVE to buy our debt and are quite comfortable putting their money to use elsewhere. The fact that the Fed is now buying Debt from the Treasury in this sneaky fashion makes it clear that without the Fed, we might have seen failed auctions. And the dollar and Treasuries are on borrowed time. Indeed, the dollar may very well start the next wave of this financial crisis. If that happens, gold could very well explode through the roof. The Chinese are in town to meet with the USGovt officials on continued debt support. The public will surely NOT be told what is discussed. One informed contact wrote this morning that the US lies as a terminal patient in the Intensive Care Ward, and seeks a death with dignity from its Chinese creditor doctors. The challenge to China is to protect its main core of US$-based reserves, and to protect future investments. Rumors are ripe that in a March trip to Beijing, Secy State Hillary cut a deal promising Eminent Domain on US property in return for continued USTreasury Bond support. So maybe a shopping basket of thousands of homes, hundreds of commercial buildings, scads of idle industrial plants, and a few million acres of farmland are soon to be seized by the Chinese in exchange for USTreasury Bond debt. One must wonder. The American people, i.e. USA Inc shareholders, will be the last to know in this criminal syndicate environment, a hatched cloud from the Fascist Business Model. Seemingly on a quarterly basis, something must be handed to the Chinese for continued USTBond support. The USTreasury officials and USFed have lied through their teeth about avoiding direct monetization. The US Embassy in Beijing confirmed the deal to the source. Hillary closed the deal. A quid-pro-quo agreement was struck, continued USTBond purchases in return for Eminent Domain option to exercise by China for property seizure, ” to physically take, inside the USA, land, buildings, factories, perhaps even entire cities.” The concepts of colonization and carpet-bagging should come to mind! WELCOME TO THE CHINESE COMMUNIST REPUBLIC OF CALIFORNIA ,just around the corner if the US Government has its way. LIBERTARIAN SOCIALISM IS THE FUTURE!!!!!!! The modern banking system manufactures money out of nothing. The process is perhaps the most astounding piece of sleight of hand that was ever invented. Banking was conceived in inequity and born in sin . . . Bankers own the earth. Take it away from them but leave them the power to create money, and, with a flick of a pen, they will create enough money to buy it back again . . . Take this great power away from them, and all great fortunes like mine will disappear, for then this would be a better and happier world to live in. . . . But, if you want to continue to be the slaves of bankers and pay the cost of your own slavery, then let bankers continue to create money and control credit. This entry was posted on Tuesday, September 22nd, 2009 at 6:03 pm and is filed under 911, CURRENT AFFAIRS, FINANCIAL INDUSTRY, POLITICS, War On Terror. You can follow any responses to this entry through the RSS 2.0 feed. You can leave a response, or trackback from your own site. True as hell. Have You seen Money as Debt movie? If no, watch it now and see how we are playing idiots with govs. These funds are either arranged by individual’s savings of his life or if they are not having that much amount in hand, there is a facility of loans i.e. house loans. Before applying for the loan, one should go through all the aspects all the terms and should see that conditions are met. yeah… I’m agree with you..